This is my first creation with a M&M Designz image....this gorgeous digi stamp is called Santa's Arrival and was created by M&M Designz and is available for purchase at Digital Ink Co for just $3. I just love this image and was very excited to be creating a card with it. And was glad that I decided to use it on my first DT card. I'm sure that this is what my daughter would be doing on Christmas Eve if we had a fireplace in our home. I love the detail of this image. From the apples in the basket to the items on top of the fireplace. 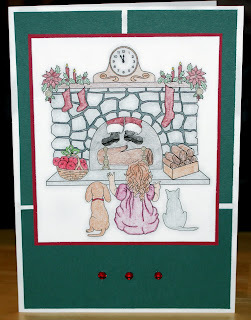 I used the sketch for this weeks challenge at Just Christmas & Birthday Cards. I loved that it was a simple design that would allow the image to stay as the focal point of the card. Please check out M&M Designz and see the gorgeous images that Judy and her mom have created. You did an amazing job on this card! You kept the soft colors that go with a little girl, and yet used the colors that are traditional with Christmas. Super Job my friend! thx for joining us at jcbc!